One of the biggest barriers for many who want to get into classic muscle car restoration is cost. Any restoration is a big undertaking, but it doesn’t have to eat up your bank account. If you play it smart and plan ahead, you can restore the car of your dreams without winding up in the red. Restoration can mean taking an entire car apart and putting it back together, so make sure you have enough space to do so. Don’t rent from someone else; this will drain your budget before you even start. Instead, clean out your garage or spruce up the shed you never use. The area can serve as storage once the restoration is complete. Knowing what you have to do for each step of the restoration before beginning will save you from surprise expenses. While it’s not possible to foresee every potential expenditure, a plan helps you work within your budget by allowing you to project costs. You’ll also have a clear list of all the parts and tools you need so you won’t wind up having to spend extra money and time fixing unintended mistakes. Sending parts of your muscle car out to be restored by professionals is too expensive when operating on a budget. Be prepared to do as much of the work as you can on your own and ask knowledgeable friends for help if you get stuck. As long as you have the necessary skills or know someone who does, you shouldn’t have any trouble getting the restoration done. Over the course of the restoration job, you’ll need to invest in different parts and tools. For example, finishing the bodywork will require paint and something to apply it with. Refer back to the plan you made when starting the restoration and use it to compare prices on everything. Be meticulous about authenticity, but don’t spend yourself into debt trying to get every detail perfect. Know where you can make compromises while still staying true to the muscle car spirit. Never go into a classic car restoration with the idea that it’s going to give you a big payback. Even when working on a budget, you’ll put in a lot of money as well as a great deal of time. Don’t expect to get back what you spend buying the car and investing in what you need to return it to its original condition. Choose a car you love and do the restoration because you want to return it to its former glory. If you do decide to sell it, set aside any preconceived ideas about what the model should sell for and simply enjoy the enthusiasm that others show for your hard work. In the field of automobile restoration, the term “basket case” means different things to different people. In general, it refers to a car that, no matter how amazing it once was, may be past the point of saving. If you truly love muscle cars, you may be able to see the promise in a basket case. However, it’s important to know when to walk away. A basket case car needs more restoration and repair work than any other. It could be damaged, rusted through, broken or even in pieces. Some parts may be missing entirely, and chances are it won’t run. If you have enough restoration experience to deal with these issues and you come across a basket case muscle car you can’t resist, be careful as you consider whether or not to buy. There’s no getting around the fact that restoring one of these vehicles requires a large budget. The car itself is likely to be the cheapest muscle car you’ve ever bought, but the total cost depends on how many parts it needs, how hard those parts are to find, the amount of bodywork necessary and the condition of the mechanical components. Know beforehand if you have the time and money to invest in the complete restoration. Purchasing a basket case to restore can be tricky. Look over the car and discuss your concerns with the seller. Find out if any parts are missing, if the existing parts are original and if there has been any extensive work done on the vehicle in the past. Do your research to make sure you’re getting a good deal and that the seller isn’t trying to pass off what they have as more than it really is. In many instances, basket case cars are past the point of being drivable. However, if you do find one that has all the parts it needs to run, make sure to test it in a safe place. Pay attention and get an idea of how the engine and brakes work to determine how much restoration they will need. If your basket case muscle car isn’t already in pieces, you’re probably going to have to take it apart. Getting it back together is like solving a jigsaw puzzle. You need to keep track of everything and have a clear picture of how you want the restoration to turn out. Divide the job into manageable sections and work through one at a time to avoid feeling overwhelmed. If at any point the restoration becomes more than you can handle on a personal or financial level, it’s time to call it quits. Though bringing a basket case muscle car back to life is rewarding, you have to know when to disengage and move on. You’ve always dreamed of owning and restoring a classic muscle car. And you think you’re ready to make the plunge. Are you sure you know what you’re getting into? Save yourself some time, money and heartache by taking a long hard look at this checklist. Ask yourself why you want to get into muscle car restoration. Is it something you enjoyed in the past and want to start doing again? Do you have extensive experience and talent in the field of restoration and want to bring a piece of history back to its former glory? Perhaps you see restoration as an investment and want to sell the car once you’ve finished with it. Knowing your purpose will serve as a guide when purchasing a vehicle. The type of car you restore is entirely up to your personal preference and should be the first thing you decide on. Check local used car listings, talk with junkyards or look in directories such as those offered by Hemmings to find your chosen make and model. As you shop around for a vehicle to restore, keep in mind that you need enough money both to cover the initial purchase and to afford the materials necessary for the restoration. This includes budgeting for unforeseen expenses. If you plan to sell the car, you want to be able to make a profit while still charging a price that buyers will find reasonable. Never purchase a car for restoration without going to inspect it. You have to see the vehicle in person to determine how much work it needs to be returned to its original condition. Some may be so rusted out that they’re not worth the investment. Others could turn into money pits if parts aren’t easy to find. As a general rule of thumb, you want to avoid vehicles that have rusted or rotted through anywhere on the body and those that can’t readily be test driven. Availability of parts and tools influence both the total cost of a restoration and how much time it takes to complete. The extent of your knowledge when it comes to restoration is also a factor. If you have to send certain parts out to an expert to be fixed up, that will add on to the cost of the process. Proper storage is essential to preserve a car once you’ve restored it. Do you have a garage, shed, storage unit or other reliable area for the vehicle? Storage for classic muscle cars should be temperature controlled and free of humidity. A concrete floor keeps dampness to a minimum. Also be sure that your intended storage area is sealed well to deter pests and ensure security. Is your classic muscle car collection ready for winter storage? Make sure your treasured vehicles retain their beauty throughout the season by following these simple steps. Whether you’re going to store your car in the garage or in a separate facility, make sure the area will stay dry all winter. A concrete floor is best for reducing moisture. If necessary, run a dehumidifier to keep the air dry. Security is also an important consideration, especially in rented storage units. Clean the entire car inside and out. Dry the exterior with a microfiber cloth to prevent damage and give the body a good waxing with quality carnauba wax. Vacuum the floors, seats and mats and remove any belongings that may be stowed in the glove compartment. This step not only ensures that your car will be in good condition at the start of the driving season but also prevents dirt from causing scratches when you put on or remove the car cover. From coolant and oil to gasoline and brake fluid, make sure all the liquids in your car are at ideal levels. Fill the gas tank and add a fuel stabilizer to keep it from breaking down and becoming gummy. To prep the engine for storage, remove the spark plugs and put a small amount of oil in the cylinders to coat them. This helps prevent rusting during the cold weather months. Replace the spark plugs once the cylinders are well coated. Disconnect the battery and clean it to remove any dirt or chemicals. If you discover any defects, dispose of it and invest in a new one come spring. If not, attach it to a trickle charger. Do not store the battery on the floor; instead elevate it on a wooden board to prevent damage from changes in temperature or moisture. Make sure that no animals can get into the area where you’re storing your classic car. Check the space for holes or cracks and seal any you find. Make sure that all doors are properly sealed as well and that there are no gaps around the windows. If you’re renting a storage facility, talk with the owners about how they handle pest control. You may also want to cover the tailpipe of the car with a bag to deter small animals from climbing inside. Last but not least, elevate your classic off the floor with blocks or jack stands. This relieves spring tension and prevents the tires from developing flat spots. Once it’s up, protect it with a cover that allows air to flow through but keeps dirt and moisture out to preserve all the hard work you’ve done to keep the car looking great. The Ford Mustang is widely recognized as the first of the American pony cars and is a legend of the American road. Since its first drive off the production lines in 1964, this muscle car has gone through a number of major changes to accommodate evolving tastes and preferences in the U.S. automotive marketplace. Here are some of the most important turning points for the Ford Mustang. The Ford Mustang originated from the T-5 project helmed by chief engineer and assistant general manager of Ford Motor Company Donald N. Frey. The objective of this project was the development of an affordable new sports car for the Ford lineup. The Mustang was the result of the combined efforts of renowned designers Phil Clark and Eugene Bordinat, engineer Roy Lunn and automotive stylist John Najjar Ferzely. The first Mustang prototypes featured a choice of two V-4 engines capable of producing 89 horsepower and 109 horsepower respectively. Production models, however, were released with V-6 and V-8 engines and considerably more power under the hood. The iconic Mustang emblem was created by Phil Clark and still adorns modern Mustangs to the present day. Just three years after the initial release of the Mustang, Ford’s design team went back to work to create a larger version of this successful entry in the automaker’s lineup. By 1971, this trend had reached its peak with underpowered, oversized Mustangs that failed to reach the market created by its initial release. A new fuel-efficient Mustang was released for the 1974 model year; dubbed the Mustang II, the new vehicle was available in coupe and hatchback and reclaimed some of its previous audience in the U.S. marketplace. Between 1979 and 1994, Ford produced four-passenger Mustangs in a variety of configurations that included coupe, convertible and hatchback models. The Cobra and Cobra R trim levels were introduced during this period and soon earned a place among the legendary muscle cars of the American automaking industry. The relatively stodgy exterior design and lackluster performance of the Mustang, however, failed to attract the buzz and sales hoped for by Ford executives and resulted in a return to the drawing board for the automaker’s design division. The fourth generation of the Ford Mustang was released in 1994 and featured a 3.8-liter overhead valve V-6 engine capable of producing 145 horsepower and 215 pound-feet of torque. The exterior of the new model featured a welcome return to the aggressive styling and powerful performance that characterized the original Mustang. This innovative retooling reignited interest in the Mustang and attracted a new generation of buyers for this classic muscle car. In 2014, the Ford Mustang will celebrate its 50th anniversary. The modern Ford Mustang incorporates more powerful engine choices, a wide array of special editions and some of the most technologically advanced features available in the automotive market. After five decades of continuous production, the Mustang continues to enjoy exceptional popularity and delivers the performance and style buyers expect from this iconic pony car. 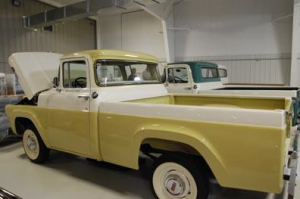 The quality of the restoration work performed on classic vehicles can have a significant impact on the value of these cars and trucks. The appraisal process for vintage automobiles can be confusing for novices to the field. Developing a basic understanding of the procedures used to arrive at a fair value for these vehicles can help car collectors in navigating this specialty marketplace. Because the value of classic cars can vary widely depending on location, professional appraisers look at the fair market values of comparable vehicles in the same regional market. Online and auction prices may also be considered if they are available to potential buyers in the same geographical area. For example, an appraiser might look at the selling price for a 1966 Mercedes-Benz 230 SL in Kansas City and compare that amount to the price fetched at auction in Wichita, Kansas. Any online auction sites might also provide added information to create a more accurate picture of the comparable prices for the same make and model of vehicle in the regional marketplace. The condition of the vehicle will also have a significant impact on its overall value in the classic car market. Concours quality restorations, for example, can command higher prices than comparable vehicles that have not been restored to similar high standards of accuracy. Documentation of the work performed on a vehicle can also be helpful in establishing the high quality of the craftsmanship and the materials used to restore the classic car to its current condition. Obviously, cars in good running condition will sell for better prices than non-functional vehicles; additionally, any dings, dents or other damage will have a negative effect on the appraised value of the car or truck. Older vehicles are typically much rarer than their modern counterparts. As with any economic commodity, valuable items that are in short supply can command much higher prices in the competitive marketplace. Some limited edition vehicles are in high demand as well; despite their more recent vintage, these cars are often highly prized and can go for extremely high prices at auction or in private sales. The rarity of a vehicle must be considered when establishing its fair market value and providing an appraisal to the owner or potential buyer. Some vehicles are more valuable because of their association with individuals in the public eye. For example, Jay Leno’s prized Fiat 500 Prima Edition sold at the 2012 Pebble Beach Concours d’Elegance for $385,000, roughly 10 times its appraised value prior to the sale. Celebrity ownership is not the only way in which provenance can affect value; cars modified by Don Yenko, for instance, can often attract much higher prices from buyers than comparable vehicles without these customization options. These factors can have a significant effect on the appraised value of vintage cars. By considering the condition, rarity, provenance and comparable prices for classic vehicles, owners and buyers can better understand the appraisal process and can ensure the right price for these elite cars and trucks. Mark Pieloch’s love affair with cars began when he was a child, riding alongside his older brothers in their 1960s muscle cars. An avid collector, his extensive collection of American classic and vintage cars contains some of the most unusual makes and models ever made in the United States. Pieloch also loves the challenge of bringing old, battered cars back to their original glory. Pieloch’s first restoration project was borne of necessity. His dad gave him a 1967 Ford Ranch Wagon to use when he went to college. The car had over 130,000 miles on it and needed some work. Without the financial means to pay for someone to repair the car, Pieloch took the project on and restored it to brand new condition. He did such a good job that the car was stolen a month after he moved to Boston for school. But that didn’t deter him. His first project sparked his interest and he enjoyed the process of taking a beat-up car and restoring it so it performed and looked like new car. For Pieloch, restoration is an artistic challenge, much like creating a masterpiece. His next restoration project was a 1965 Mustang GT Fastback. After that, there was no stopping him. He restored several Mustangs, Camaros and Bel Airs, rarely selling any. After all of his hard work, he found it impossible to let them go. The Mark Pieloch Classic Car Collection has over 130 classic and antique vehicles. All American made, each is either a low mileage original or full frame-off restoration, restored to national show-winning standards. The collection includes over 25 Indy 500 pace cars, including a rare 1955 Bel Air Convertible and a 1957 Mercury Turnpike Cruiser Convertible. Over 25 of the cars in the collection have less than 100 original miles. The collection contains a complete set of Boss Mustangs from 1969-1971. The collection has several very rare cars, such as a 1966 Yenko Corvair race car, a 1968 Yenko Camaro with only 5,800 original miles and a 1969 Yenko Camaro with 9,900 original miles that was Don Yenko’s personal car, known as “UNO.” One of the most rare cars in the collection is a 1972 Yenko Vega Wagon. Only 50 were ever produced and Pieloch’s is the only one known to still exist. His 1981 Yenko Camaro Stage III Turbo Charged is only one of three ever produced and the only one known in existence. Numerous 1955 and 1957 Chevrolets, Fords, Mercurys, Bel Airs, convertibles, Nomads and pickups round out the vehicle collection. His collection of classic cars has won over 80 First Place National Car Show awards. In addition to the vehicles themselves, Mark also collects car-related memorabilia. Vintage artifacts include more than three dozen restored antique gas pumps, over two dozen restored antique pedal cars, over a dozen antique radios (including an extremely rare 1949 Coca Cola table top radio), more than a dozen restored antique balloon-tire bikes, over 100 restored neon auto signs, a restored 1952 Seeburg Model 100 jukebox and several antique restored soda coolers. 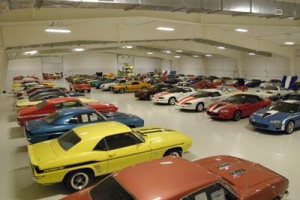 Currently, the Pieloch Classic Car Collection is located in Syracuse, Nebraska. Pieloch is building a new facility to house the collection in Florida. Completion is expected within the next two years. Mark Pieloch fell in love with cars at a young age. As a child in Massachusetts, his older brothers often let him ride along as they took drives in their 1960s muscle cars. Since then, he has restored and collected 130 antique and classic American vehicles. The collection currently boasts over 30 Corvettes. Chevrolet, a division of General Motors (GM), manufactures Corvettes. Chevrolet has a long and storied history. In 1911, Louis Chevrolet and ousted GM founder William Durant started the Chevrolet Motor Company. In a reverse takeover, Durant acquired a controlling stake in GM, took over the presidency again and Chevy became part of GM. Although design work on the first Chevrolet began in 1911, the first model, the expensive Series C Classic Six, was not introduced until the 1913 New York auto show. The now famous bowtie symbol that signifies Chevy was first used in 1914. Over the years, Chevrolet and Ford engaged in competitive rivalry that still goes on today. The 1950s and 1960s were landmark years for Chevrolet. During this time period Corvettes and Corvairs were introduced, Chevrolet’s first fuel-injected engine made its debut and, by 1963, one in every 10 cars sold in the United States was a Chevy. Although Chevrolets were wildly popular in the early 50s, they hadn’t ventured into the sports car arena. Triumphs, MGs and Jaguars were on the market, but GM’s reputation as a staid family-car manufacturer seemed to preclude sportier journeys. Designers inside the company, however, came up with an idea. Chief designer, Harley J. Earl, thought that there was a market for an affordable sports car and handed the idea to Robert McLean. McLean decided to use already available mechanical components, the same inline-6 engine used in other Chevy models but with a higher compression ratio and an aggressive cam that ramped the output to 150 horsepower. To keep the car affordable, the body was made of fiberglass, not steel. Ed Cole, Chevy’s new chief engineer, had been working on a small-block V8. He took over from there and, in 1953, the first Corvette was introduced. The 1953 Corvette look sleek and futuristic, but it performed well below expected sports car standards. It was also costly for the consumer. Priced at $3,498, it was over $1,000 more than Chevrolet’s eight-passenger Deluxe station wagon. The 1954 model Corvette was relatively the same as the original, but consumers were given more color options to choose from. Big changes came in 1955. The small-block V8 was finally ready and a few 1955 models were powered by the new engine. The Corvette came of age in 1956 with its new engine, chrome teeth, scalloped flanks and a removable top option. The early 1960s Corvettes had bigger and more powerful engines. Many Corvette enthusiasts tout the 1962 model as the greatest Corvette ever. In the mid-1960s, Chevrolet introduced the Corvette Stingray. With a new look and more efficient styling, the Stingray was wildly popular with consumers and sales topped over 20,000 in 1963. Many collectors consider the 1963-1967 Corvette models the best of the best. The Corvette is still manufactured today and Chevrolet recently reintroduced an updated Stingray. With over 30 vintage Corvettes, Mark Pieloch is proud to own these iconic symbols of America’s love of the open road.